We’ve always been a fan of Esquire magazine’s “The Rules” — humorous truisms for men — so we thought it’d be fun to come up with some rules specifically for Chicago men. We’re calling our rules The Chicago Ways, a name that obviously comes Sean Connery’s speech in The Untouchables. This will be an ongoing series, and we welcome submissions (send them to Mark@ManUpChicago.com or put them in the comments section). The ubiquitous Jeremy Piven is undoubtedly a star, but we're pretty sure anyone who lives here has seen him out and about. 1. You don’t go to the Beaumont, you just end up there. 2. You’re not an actual Chicagoan if you’ve never hung out on the South Side. 3. Activities you don’t need to do more than once: ride the Navy Pier Ferris Wheel, visit the Sears Tower observation deck, eat more than one slice of pizza at Gino’s, hang out on Weed Street, go to the Beaumont. 4. 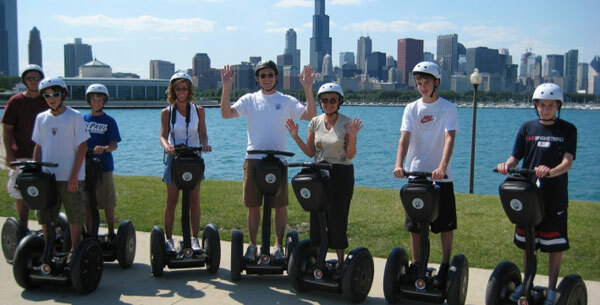 Activity you never need to do ever: Chicago Segway Tour. 5. Playing coed 16-inch softball is a decent way to meet women. Showing off injuries sustained from playing 16-inch softball is not. 6. Chicago Celebrity Sightings Hierarchy — in relation to how excited you should be to see them in public. (Note: We’ve excluded Obama, Jordan, Ditka and Oprah — they exceed any sort of ratings chart). 7. There is never a good reason to ride a quadcycle on the Chicago lake path.